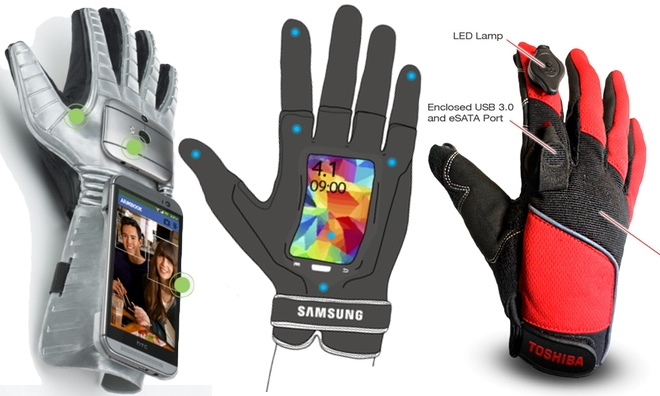 With accusations of copying and commoditization already rife within the smartphone and tablet industries, three of the market's biggest names —Samsung, HTC and Toshiba— all showcased similar glove-themed prank products on Tuesday for April Fools' Day. Hilarity ensued. In efforts to make light of the tech industry's obsession with wearable electronics, bogus announcements for Samsung Fingers, HTC Gluuv, and Toshiba DiGiT were all revealed by the Asian device makers. All three fictional products are shown to include support for recognizing finger gestures and integrated cameras for snapping pictures from the hand. The fake handwear are also shown featuring speakers, microphones, advanced sensors, high-resolution screens, wireless connectivity, and other checkbox items frequently found in promotional materials for smartphones. The requisite eye-roll-inducing jokes were also made: Samsung dropped a "talk to the hand" reference straight out of 1996, HTC suggested "armies" will become the new "selfies," and Toshiba put out a well-produced video featuring actors making buffoons out of themselves by placing their hands and fingers in front of their faces. Cue up the laugh track. Even when it comes to lame jokes, these companies struggle to differentiate themselves from one another. The fact that all three companies introduced such similar spoofs for April Fools' Day 2014 is somewhat ironic, given not only the fact that virtually all modern smartphones and tablets have similar designs and functions, but also that many companies are or have been engaged in lawsuits accusing one another of copying designs and concepts. Despite a history of crying theft, it's unlikely any jokes were "stolen" here, as all three side splitting witticisms were posted on the same day. Instead, this is just another example of how many technology companies aren't particularly clever or original. Samsung, HTC and Toshiba also all rely on Google's Android platform to power their most popular smartphone and tablet models, making direct comparisons between the companies' products inevitable. Given this commoditization, device makers frequently apply custom changes to Android to help differentiate their products from other competing products. None of the gloved gags revealed Tuesday made any mention of what operating systems they might run. Could those slights be foreshadowing certain doom for Google's forthcoming Android Wear platform? Did you know it's easy to make a ridiculous statement if you phrase it as a question?